UPDATED: Tue., April 11, 2017, 12:35 p.m.
Editor’s note: A previous version of this story incorrectly stated when the Spokane Police Guild’s contract expired. The story has been updated to correct the error. 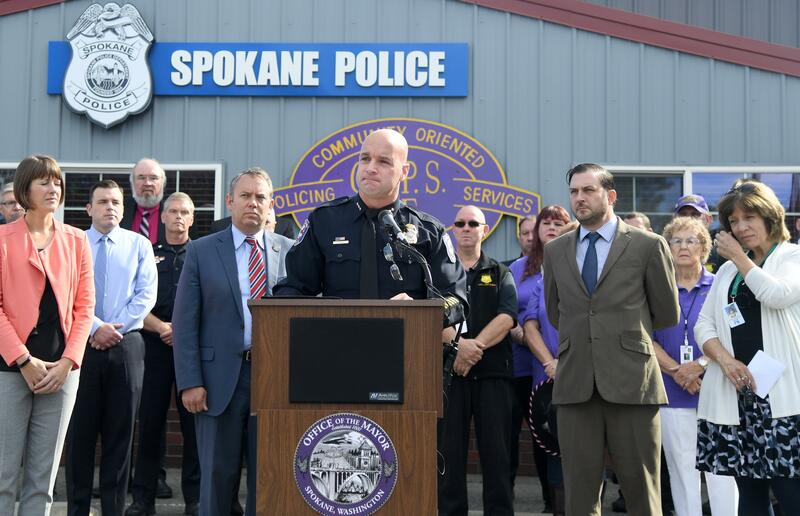 The Spokane City Council wants Mayor David Condon to take a hard line on police overtime and bolster the authority of the civilian overseeing the department when negotiating the city’s next police contract. The panel signed a letter Monday night to the mayor highlighting their priorities in talks with the Spokane Police Guild, whose contract expired at the end of last year. The contract rolls over until a new agreement is negotiated between the union and the city. All seven members of the council voted in support of the letter. City Councilwoman Lori Kinnear, who brought the letter forward, said it was a way for her colleagues to funnel residents’ requests for the new contract to Condon early in the negotiating process. “This isn’t a ‘Do-this-or-else’ thing,” said Kinnear, who said she compiled the letter after conferring with all members of the council. Brian Coddington, a spokesman for Condon, said Monday the letter was drafted without the mayor’s input and he’d wait to see the proposals before commenting. “He’s still waiting to see the final version of the letter,” Coddington said. The list of priorities signed Monday night includes a request to amend police department policies to limit how many overtime hours an individual officer can work and institute a method of applying for overtime that isn’t based solely on an employee’s seniority. Last year, 211 officers, sergeants and senior police officers in the department earned a total of $2.4 million in overtime pay, according to city payroll records received through a public records request. The agency as a whole paid nearly $4.4 million in overtime, the most of any city department. A recent culture audit of the department found several employees felt overworked and the agency understaffed. Kinnear said the culture audit’s findings did not influence the council’s requests because the results were published after the letter was drafted. The letter incorporates several initiatives of City Councilman Breean Beggs, who has been working on a new draft of the law governing the department’s ombudsman office, including the hiring of “property crime technicians” who don’t hold a commission with the department, but can collect evidence and respond to the scenes of crimes. The council’s letter asks that Condon push to codify several reforms to the ombudsman office council members say were demanded by the public in a voter referendum calling for civilian oversight of police. That includes increasing the number and type of incidents Spokane Police Ombudsman Bart Logue can investigate, allowing him to rule if the police department’s internal investigations into alleged officer misconduct are accurate and complete, and requiring the department to formally respond to any of the ombudsman’s recommendations within 30 days. Beggs said the letter was a way of encouraging Condon to open negotiations with the Police Guild. He said it appeared the administration was waiting for the City Council to pass an ordinance codifying changes to the ombudsman laws, but that shouldn’t put negotiations on hold. “We’re still jostling with each other, and trying to get it right,” Beggs said. Whether the contract with the union representing officers adhered to the citizen initiative requiring oversight was a point of contention during the last round of negotiations with the guild. The Spokane City Council unanimously voted down the first proposed agreement between Condon and the union after voters approved Proposition 1 in February 2013. City Council President Ben Stuckart said the letter should be “noncontroversial” and was a way to show Condon that council members were united in their call for a more empowered ombudsman’s office as negotiations with the guild begin. “I think it’s very helpful, and very straightfoward,” Stuckart said. “Everyone told us after the last round of negotations that they didn’t think it went far enough” on oversight. Liz Moore, director of the Peace and Justice Action League of Spokane, and Tim Connor, an organizer with the Spokane Police Accountability & Reform Coalition, urged the council to include stronger language about the role of the ombudsman in the letter. Stuckart responded that the council remained split on how the ombudsman should conduct an investigation into officer misconduct at the same time the police department works on its own investigation. The city is represented in negotiations with the guild by Elizabeth Kennar, a labor and employment attorney with the Summit Law Group based in Spokane, as well as members of Condon’s administration, Coddington said. Published: April 10, 2017, 9:42 p.m. Updated: April 11, 2017, 12:35 p.m.